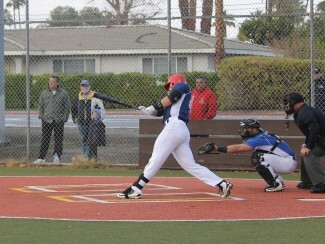 Nick Jewett of the Coachella Valley Snowbirds connects on an RBI single on Thursday, January 19, 2017. Photo by Steve Sitter. PALM SPRINGS, Calif.–– Normally a sun-soaked affair, Opening Day of the California Winter League was instead inundated by a powerful and sustained rainstorm that threatened to wash away the full day’s slate of games. To the poets among us it must have seemed only fitting that after being blessed with years of beautiful winter weather, such a deluge would appear to soak the desert sand ahead of the League’s eighth season and scuttle the day’s festivities amidst the Coachella Valley’s wettest winter in recent memory. But, as the day progressed, the weather lightened, and the desert sun finally shone through the now retreating clouds long enough to allow two of the league’s six scheduled games to be played. 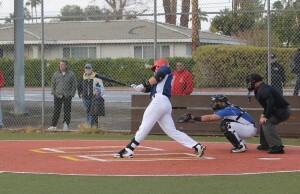 The action began on the Palm Springs Auxiliary Field with the Coachella Valley Snowbirds defeating the Washington BlueSox by a final score of 6-1. Right handers Dakota Freese and Casey Upperman led the way from Manager Gabe Suarez’s unit, as the two combined to limit the Sox to just one hit on the day. Freese earned the win by hurling 5.1 standout innings, while striking out eight batters and allowing just a one hit and a single run. The righty faced trouble in just two of his innings of work, and from the second through the fourth inning faced just one batter over the minimum, with the his lone baserunner reaching via an error. With a pair of baserunners aboard with one away in the bottom of the sixth, Freese was lifted and replaced by Upperman, who recorded the game’s final five outs, including three punch outs, to seal the win. Chance Hicks started on the bump for the Blue Sox, pitching three scoreless frames while limiting the Snowbirds to just one baserunner. Sox manager Andrew Cotner went to the pen to replace the submarine throwing righty to start the top of the fourth. The move would prove disastrous, as the Snowbird offense capitalized to plate six runs in the frame against reliever Tyler Wilson, thanks primarily to an RBI single by first baseman Nick Jewett, and a trio of Blue Sox errors. Switch hitting outfielder Jonathan Crank also provided some thump for the Snowbirds, as he sent a two out, first pitch offering from Wilson over the right field wall for a three run homer to cap the scoring in the inning. Cotner’s subsequent bullpen maneuvers proved much more effective for the Sox, as the trio of Cristian Salina, Yujo Kitagawa, and Nigel Nootbaar kept the Snowbirds off the board with scoreless innings in the fifth, sixth, and seventh, respectively. Blair Beck provided the game’s only offense for Washington when he broke up Dakota Freese’s no-hit bid in the sixth with an RBI triple into the gap in left-center field. In the day’s second and final ballgame the Toronto Rush pounded out ten hits in an 11-1 romp over the Manitoba NorthStars. Early returns indicated a tight ballgame, as Manitoba starter Joseph Webb allowed just one run through his three innings of work, while Rush starter JT Mickelson hurled two scoreless. The score held at a 1-0 Toronto lead into the fourth inning, when NorthStars Manager Boots Day lifted Webb in favor of reliever Shawn Kahre, whom the Rush victimized for seven runs over two innings. So torrential was the Toronto offensive attack that it was interrupted only briefly by the arrival of a helicopter, which hovered briefly over the field, having been summoned in an unorthodox attempt to dry the infield on the main diamond inside Palm Springs Stadium. 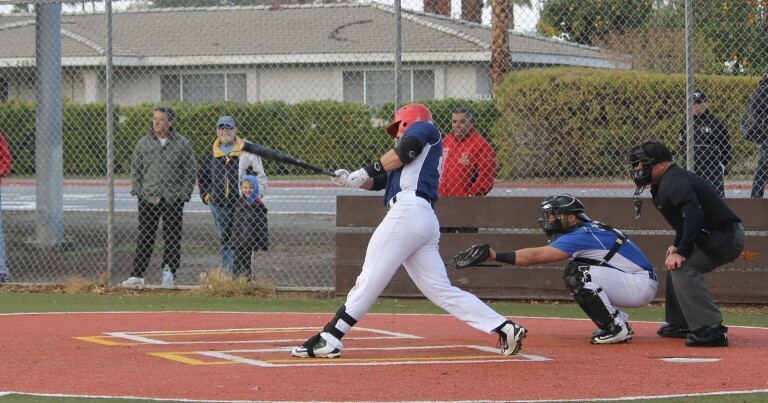 Catcher Kevin Farley led the way for the Rush, picking up three hits on the day, including a double, while driving in two and scoring three runs. Starter JT Mickelson earned the win for his efforts for the Manager Tom Vaeth and the Rush, while relievers Paul Murphy Andrew Moralez, and Norman “Goose” Coleman-Goodman limited the NorthStars to just four hits and one run in five combined innings. 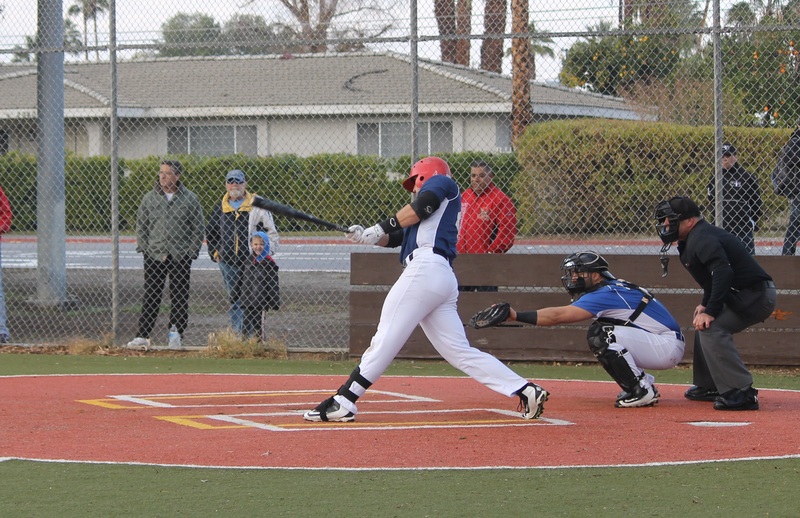 The California Winter League season will continue tomorrow, weather permitting, with an amended schedule that features all twelve teams in action. Inside Palm Springs Stadium, the Canada A’s take on the British Columbia Bombers at 8:00 AM, Hit King takes on the Palm Springs Chill at 10:30 AM, and the Washington Blue Sox take on the Toronto Rush at 1:00 PM. Over on the Palm Springs Turf Field, the Palm Springs Power take on the Alberta Grizzly at 8:00 AM, the New York Colonials take on the Oregon Lumberjacks at 10:30 AM, and the Manitoba NorthStars take on the Coachella Valley Snowbirds at 1:00 PM. Fans, remember that tomorrow in Canada Day at the ballpark! All fans with valid Canadian ID will be able to purchase tickets for just $2.00! Come out to the ballpark for some good, old fashioned fun!